As an ATP Electronics distributor, NAC supplies ATP's full offering of flash based memory modules and storage cards for industrial and high reliability markets. Established in 1991, ATP has accumulated many years of experience in the design, manufacturing, and support of high performance, highest quality DRAM modules and NAND flash storage products. ATP focuses in mission critical applications such as industrial/automation, telecom, medical, and enterprise computing where high levels of technical support/expertise, consistency of performance, and manufacturing quality are required. A certified Eco/Green partner of tier one OEMs, all ATP products are fully RoHS and China RoHS compliant. A true manufacturer of both flash and DRAM products, ATP offers in-house design, testing, and product tuning at both the system and component levels. In addition, ATP supply chain support includes controlled/fixed BOMs and long term product life cycles. ATP's System-In-Package (SIP) flash product manufacturing process is the backbone of their superior build quality and durability. The industry leading SIP process involves advanced wire bonding, stacking, and encapsulation stages which make ATP products more consistently durable and reliable with waterproof, extreme temperature durability. 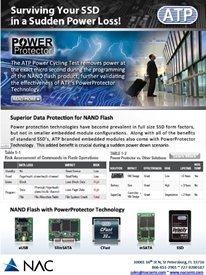 A technology driven company, ATP continues to expand its product portfolio with new unique features such as PowerProtector, which manages and ensures the completion of NAND flash operations during a power failure. ATP PowerProtector's leaner requirements for board footprint also allows for support in smaller form factor NAND storage such as CF, mSATA and eUSB SSD. ATP also introduces Enterprise Grade DRAM modules featuring Elevated Temperature Burn In Testing, raising the quality standard for DRAM modules targeting mission critical applications. The Elevated Temperature Burn In System features a unique chamber design allowing for flexibility in customer specific temperature profiles and also features a flexible monitoring/control system. The ATP brand continues to grow through both consumer and industrial OEM sales channels. With multiple offices in the United States, Asia, and Europe, ATP offers worldwide support in both engineering and sales. ATP adheres to the strict ISO9001 QA standards for quality and compatibility. All ATP memory products are RoHS, CE, and FCC approved. Need an SSD that survives Sudden Power Loss? ATP has you covered.